Director of Fire & Emergency Services, Panaji ,Goa, invites Application from interested and eligible candidates for recruitment to the post of “10 Sub Officer (Group C Non Ministerial-no Gazetted)”, ’33 Driver Operator’, 07 Watch Room Operator’, ‘183 Fire Fighter” on permanent basis with Government Pay scale & other benefits. Goa Public Service Commission (GPSC), Panaji, Goa invites Online Application from interested and eligible candidates for recruitment to the post of “Lecturer in Surgery (Goa Medical College)”, “Assistant Lecturer in Forensic Medicine & Biochemistry (Goa Medical College)”, “Senior Medical Officer for anti Retro viral Therapy Centre”, “Medical Officer for anti Retro viral Therapy Centre”, “Lecturer in Orthodontics and Dentofacial Orthopedics (Goa Dental College & Hospital)”, “Junior Consultants (Radiologist, Pediatrician, Pathologist, Surgeon, Physician) for Directorate of Health Services” “Ayurvedic Physicians (Directorate of Health Services)”, “Junior ENT Surgeons ” “Research Officer ( Goa Gazetteer Department)”, “Assistant Professors in Government College (Geography, Political Science, Commerce, Commerce-Accounting, English) for Directorate of Higher Education”, “College Director of Physical Education ” and “Assistant Geologist (Directorate of Mines & Geology)” on permanent basis. 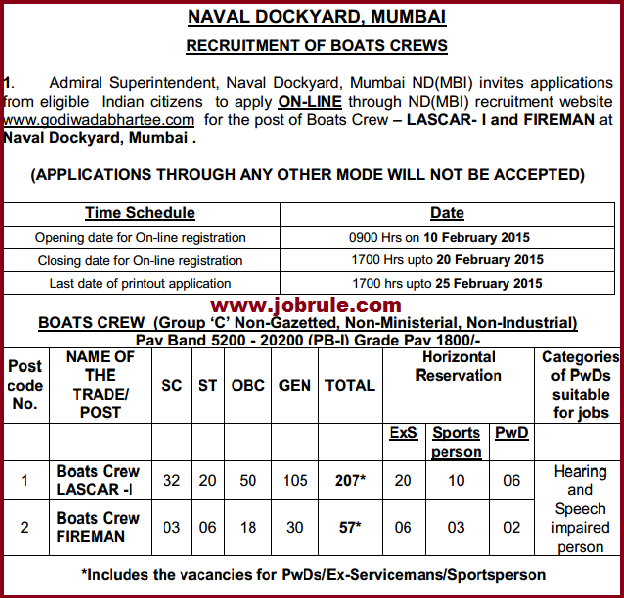 Admiral Superintendent, Naval Dockyard Mumbai (ND/Mumbai) invites Online Application from eligible Indian Nationals for recruitment to the post of “ND Mumbai Boat Crews (Lascar-I & Fireman) to ND Mumbai official website (recruitment) (Boat Crews Group C Non Gazetted , non Ministerial ,non Industrial) in the pay scale of Rs.5200-Rs.20200 with Grade Pay Rs.1800. Konkan Railway Corporation Limited (KRCL), Maharashtra ,invites application in prescribed format from eligible land losers candidates (Self/ Sons/ Spouse/ Unmarried daughters /Grandsons /unmarried grand daughters only) whose land has been acquired for Konkan Railway project, irrespective of the percentage of land lost, and from Only SC/ST candidates from other than land losers registered with the Employment Exchange along Konkan Railway route within the Jurisdiction of Konkan Railway Corporation Ltd. (Raigad, Sindhudurg, and Ratnagiri districts of Maharashtra, Goa States, and Karwar, Udopi and South Kannada districts of Karnataka) for recruitment to the post of “Assistant Station Master (ASM-Operating)” on regular permanent basis. 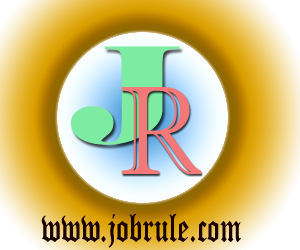 Regular 3 years Graduation in any discipline from recognized university or institutions. 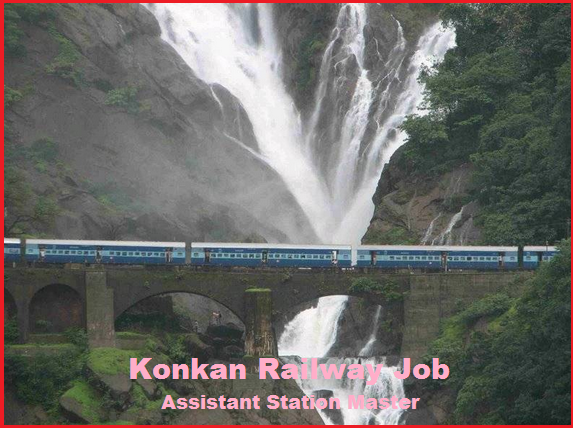 Candidates appearing at/and or awaiting result of final examination are not eligible for Konkan Railway ASM recruitment 2015. 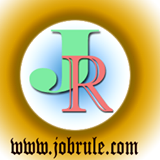 Rashtriya Chemical & Fertilizer Limited (RCFLTD), a Government of India under taking, Administrative Building, Chembur, invites application from eligible and interested candidates to recruitment for the post of ‘RCF Engineer (Boiler Proficiency)’ on regular basis for it’s manufacturing unit Maharashtra (at Thal District Raigad and at Trombay/Chembur, Mumbai).